The recent million-fold brightening of Holmes 17P has put another dent in conventional comet theory. Should the "dirty snowball" hypothesis be discarded in favor of electrical activity? Astronomers recently announced the unexpected brightening of a small comet as it passed through the constellation Perseus. Called Holmes 17P, the comet began a significant energetic outburst on October 24, 2007. At that time, observers reported that it had begun to increase in luminosity "for no apparent reason." Overall, it gradually brightened from 17th magnitude to about 2.5, bringing it into naked-eye visibility. 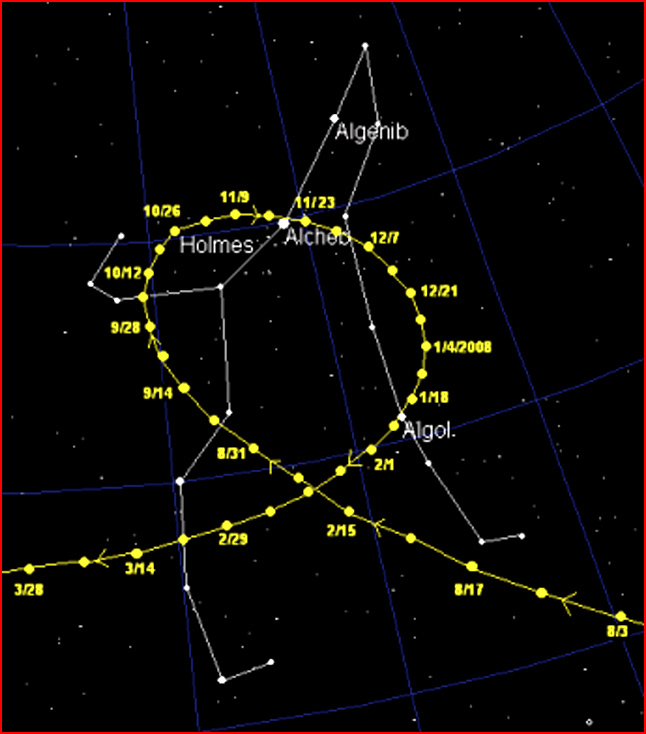 Edwin Holmes discovered the comet that bears his name on November 6, 1892, as he was observing the Andromeda galaxy. The comet was apparently experiencing a similar increase in brilliance during that time, since Holmes reported it to be of approximately 5th or 6th magnitude. A historical narrative providing several highlights in the story notes that the comet is periodic, orbiting the sun every 6.9 years and staying between Mars and Jupiter. In a previous Thunderbolts Picture of the Day article about the fissioning of Comet West in 1976, we noted that comets tend to split or to undergo anomalous displays when they are approaching their farthest distance from the sun. Because conventional theories of the solar system based exclusively on gravity expect disruptions only at close approaches to the sun, the activity of comet West was a surprise. Comet Linear defined another mystery in July of 2000 when it actually blew apart. The strangest thing about its fragmentation was that it occurred at a distance of over 100 million kilometers from the sun and not when it passed by during perihelion. As a matter of observation, the majority of cometary disruptions take place when they are far from the sun. Another counter-intuitive reflection is that so-called "sun-grazer" comets do not break apart despite approaching to within 50,000 kilometers of the sun's surface in some cases. The large comet Hale-Bopp, also did not obey the standard theory of cometary activity. Four years after its encounter, in a region past Jupiter's orbit, the comet displayed an ion tail, several jets of bright material spewing into space and a glowing coma. The "dirty snowball" theory cannot account for such activity at distances where solar energy emissions are so weak that ice will not melt. If solar heating were responsible for cometary discharges at such distances, then all the frozen moons of Jupiter would be as dry as deserts and would look more like our own moon than the icy bodies that they are. If the sun's warmth is not the impetus for Hale-Bopp's display, then what is it that provides the energy for supersonic blasts of dust and ice when it is so far away? Comets spend most of their time far from the sun where the charge density is low. Because comets move slowly, their electric charges reach equilibrium with the weak, radial solar field. As they get closer to the sun, however, their nuclei speed into regions of increasing charge density and varying electrical flux. Their polarity and charge characteristics respond to the increasing solar forces, so a coma (charge sheath) forms around them. Discharge jets flare up and move across the surface very much like the plumes of Jupiter's moon, Io. If the charge imbalance becomes too great, the nuclei may explode like an over-charged capacitor, breaking into fragments or vanishing forever.